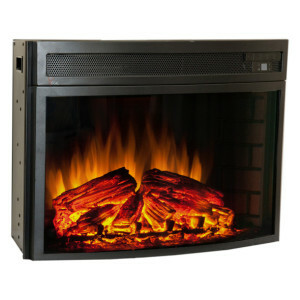 The Comfort Smart Verve 24-in Curved Electric Insert gives a fresh alternative to the traditional electric fireplace insert. The contemporary styled, curved front firebox creates a larger, panoramic viewing angle for a better visual presentation. The unit features a realistic log set, grate and ember bed. The all LED flame lighting creates a beautifully realistic fire effect that will have you second guessing its authenticity. Additionally, the brick sides (with optional down lights) finish off the life-like fireplace experience.